Our first blog post comes more than a year after we bought Farrand Hall. I don't think Jacob and I ever had a single minute to even think of writing a blog, let alone what we would even want a blog to be for us. But now that the house is in a good place we have started talking about this and what we want to share with people who are interested in Farrand Hall and what we have planned for this historic property. For our first post we thought it apropos to just keep it simple and talk about how we stumbled upon this house and why it spoke to us. And of course we are going to show you some before and after photos! When we started talking about our dream of owning a little property in the country it wasn't with grand ideas of a large historic house. On the contrary. 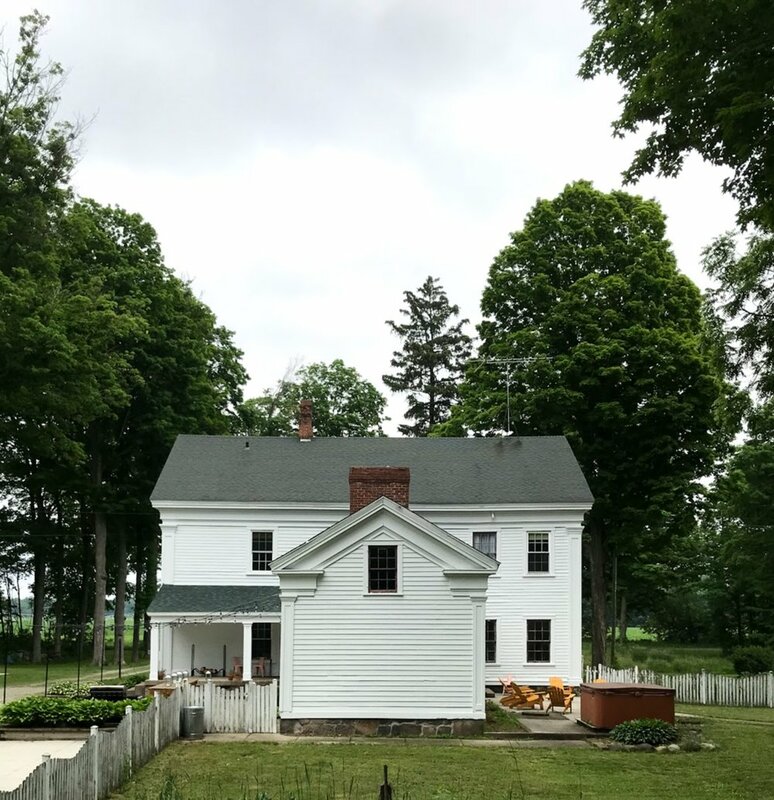 We wanted something quaint and farmy with a few acres to have some gardens and enjoy a little r&r away from the fast paced Chicago life. Jacob would research properties on the internet and send me listing almost daily. Nothing really spoke to us to make us drive out to see anything. Then one October day he sent me the listing for Farrand Hall. It was big and the pictures were terrible and it just looked like a big old house ready to fall over. And not to mention not really in the budget. But Jacob loves architecture and old house and so this is where it all begins. We didn't really think too much about the house for a while after that, but I am certain that Jacob kept that listing bookmarked and looked at it daily. One day in late November he called me from the expressway saying that he just felt like we needed to see it in person. I agreed thinking this would be fun day trip into Michigan regardless of what condition the house was really in. He called the agent and set up an appointment and on December 15th we drove two and half hours to Colon, Michigan to see a house that was 163 years old and on the National Register of Historic Places. It was cold and snowy and as we turned down the windy country Findlay Rd a sudden blizzard hit. I don't think we were driving more than 10 miles an hour and all I could think was oh brother what are we doing! The road turned to Farrand Rd and we finished the drive to the house. There it stood, covered in snow, in the grey and gloom. The white paint had greyed and was chipping everywhere. Parts of the facade had been fixed but never painted and the wood was silver and nearly falling off the house. There were holes all over letting squirrels, raccoons, mice, birds and bats into the house. I felt a bit of disappointment and have to admit that there was a bit of hope that we saw it in person it would be in better shape than the photos had let on. I was wrong. It was pretty bad. The house was winterized at that point. No one had been living in it for more than year. There was no heat and no running water. It was freezing! And I am sure the agent, Laura, thought we were just another couple people wanting to see an old house with no intention of really buying it. It was hard to imagine what the house could be at that time. No one had pictures of what the grounds looked like in the Summer. All we really knew at that point was that this house would need a lot of TLC and was certainly not what we had been looking for when we started. We did talk a lot about it, but I don't think either of us thought this was a decision we were ready to make. A few weeks passed and we got a call from the Laura, the agent, telling us that they thought a cash offer was going to come through on the house and wanted to gage our interest. So with a sense of potential regret we made an appointment to go out and see it again on January 15th. And just like the first time Findlay Rd gave us a blizzard. When we pulled up the driveway there was indeed a sense of familiarity already. Probably because we had spent so much time looking at the pictures online. Nothing was different though. Still winterized, still a big mess, still a very big project that would take time, money, and a real vision for bringing it back to life. Laura met us again and graciously walked us through the freezing house. This time we looked at every detail. Opened every door. Checked floors, moldings, windows, walls, every detail. I think what we needed was evidence that this place had something special buried underneath years of neglect. And after the second trip I think we saw Farrand Hall in a very different light. We drove away talking about what the property could be. Not just a weekend or Summer getaway for us and our friends. This house was a much bigger project and represented something special for the community of Colon, Michigan. This history was powerful and the house was one that everyone in the area knew. The stories went back over 165 years when Henry K. Farrand settled in the area. But was this something that we thought we could really undertake? You know the answer already and so we made an offer. And on May 1st, 2017 the house was ours. We will share more of the last year of the renovations and design in future posts. But for now we will just leave this here with a before and after picture.